Last Saturday I was volunteering at a PSC Support meeting at the Queen Elizabeth Hospital in Birmingham. These face to face meetings allow people affected by PSC who often feel isolated and their condition and symptoms misunderstood to meet with others in the same situation. Knowing that they’re not alone can have the most remarkable positive effect on PSC suffers and their families. I remember when Martine went to her first meeting and she came back with a far more positive outlook after talking with someone who had gone through a liver transplant after having PSC and was doing really well. The other part of these meetings is bringing together medical experts and PSC researchers to share their knowledge and deliver updates on their work. 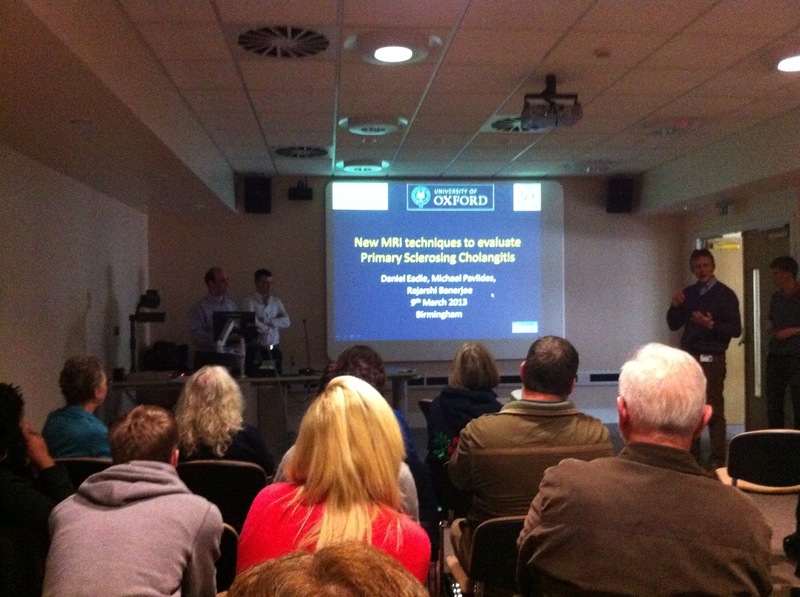 This time we had presentations around Liver transplantation in PSC and new scanning techniques which could dramatically improve Liver diagnostics and reduce the time of clinical trials. A lively Q&A session followed – and this was very welcome because you typically don’t get that kind of time and access to a consultant when attending your regular clinic appointment. We also received an update on medical research on PSC and this was very exciting. There’s genetic profiling research due to be published later this year which should identify many of the genes associated with PSC – in fact it may even suggest that PSC is a cluster of similar but slightly genetically different conditions. That kind of insight can really help clinical research into possible therapies. Another enticing research strand in the UK is looking at the autoimmune nature of PSC and seeing if existing drugs can be targeted to halt and even potentially reverse the effects of PSC. Of course all that takes time and money and that’s one reason that I’m fundraising for PSC Support – to enable them to make the research grant contributions that help medical science move closer to understanding the mechanism of PSC and to find effective therapies. Events like last week both inspire me when I hear the various “PSC’ers” stories and give me hope when I see the research direction and energy.